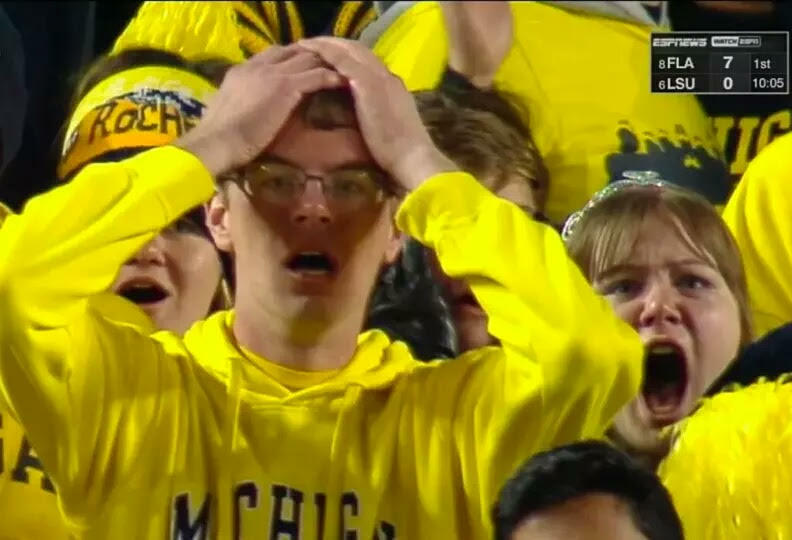 Fans react to the end of the Michigan-Michigan State game on October 17, 2015. The Spartans outgained the Wolverines, but Michigan held the lead until the last play. How? By relying on great special teams play, especially from their fantastic punter, Blake O’Neill. O’Neill grew up in Melbourne playing Aussie Rules Football, a game that requires unusual strength, stamina and coordination. He decided to jump the ocean to play American college football, first at Weber State, and now at Michigan. When Michigan head coach Jim Harbaugh met him this summer, and asked him to kick the ball, O'Neill asked, "Which way?" Unlike American kickers, O’Neill can deliver the football high, low, or with a running start to his right. Harbaugh liked them all, and made O’Neill the team’s starting punter. He has stuck half his punts inside the opponents’ 20-yard line, for average returns of less than two yards. Against Michigan State, O’Neill was in top form, kicking three punts inside the Spartans’ ten-yard line, one of them a staggering 80 yards, the longest in Michigan Stadium’s history. With Michigan holding a 2 point lead, and ten seconds left with the ball at mid-field, Michigan needed only to punt the ball, and kill the remaining seconds to win. The snap came to O’Neill a little low. The ball bounced off his hands, and onto the turf. He scooped it up, and tried to kick it. But instead, he inadvertently tossed the ball to Michigan State’s Jalen Watts-Jackson, who dashed down the sidelines for the game-winning score. Michigan State fans were ecstatic. Michigan fans were too shocked to be upset, standing with their hands on their heads in stunned silence. Given the unbelievable events, I thought the players, coaches and fans generally carried themselves with class. The only disturbing behavior came from a minority of Michigan fans – not toward the Spartans, but Michigan punter Blake O’Neill. A man named Chris Vomish tweeted that O'Neill should go to the equipment room and "start chugging that bleach my friend." After fans reacted to his tweet, Vomish deleted it, explaining that, “Everyone's entitled to their opinion,” apparently confusing his asinine comment with an actual opinion. Another tweeter told O'Neill to "jump off of a cliff into a pool of spikes and cyanide" and that "you might as well cut your hands off." Alas, this is not new. In 1905, Michigan was riding a 56-game winning streak. In the last game of the season against arch-rival Chicago, Michigan’s Denny Clark tried to run the ball out of the endzone, got caught for a safety, and Michigan lost 2-0. Since then, the only thing that's really changed is the Internet, where cowardice masquerades as courage. Clark received hate mail and death threats, but also a rousing reception upon his return to campus. However, 27 years later, in a Portland, Oregon, hotel room, he wrote a note saying he hoped his “final play” would make up for it all, and killed himself. Since then, the only thing that’s really changed is the Internet, where cowardice masquerades as courage. Twitter amplifies the worst sides of our worst people. But the better angels among us, including some Spartans, stood up and showered O’Neill with sympathy and support. They even set up a Facebook page for O’Neill, which has more than 11,000 subscribers. Today is a good time to remember that these games only matter because we say they do – we created this play in the first place. Sports build character, but they also reveal character -- and not just of the athletes. 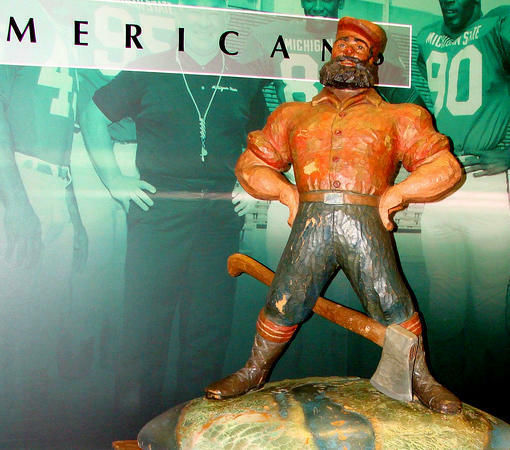 John U. Bacon shares his thoughts on this weekend's MSU-Michigan game on "Stateside with Cynthia Canty"